» Benchmade Griptilian Review – A Versatile Folding Knife? Benchmade Griptilian Review – A Versatile Folding Knife? If you take one piece of equipment with you when you venture off the beaten track, make it a good knife. Whether you’re hiking, hunting or sailing it’s an essential tool that can get you out of a lot of tight spots. With a decent blade you can make a shelter, shave tinder for a fire or clear away damaged rigging. You can dress a deer or clean a fish, and of course there are always little things needing cut, right down to bits of string. A quality knife is a lifesaver. Where a lot of people go wrong is in choosing the right knife. Multi tools are very popular right now, and they’re definitely useful, but the blades tend to be pretty small and often not that great. They’re also heavy and bulky. Useful tools, for sure, but not ideal as a primary knife. Then there’s the size issue. A lot of outdoor sport enthusiasts go for a big belt knife, but this is one area where size isn’t everything. You need a blade with a long enough cutting edge to handle a wide range of tasks, but realistically that’s three or four inches. A six or eight inch blade, most of the time, is just weight and bulk you don’t need. Fixed-blade knives are also a lot harder to carry discreetly and can attract unwelcome attention. That would be a worthwhile sacrifice if they were more useful, but they’re not. For general cutting tasks they’re no better than a smaller blade – often worse, because they’re not so handy. For heavy duty chopping they don’t have the required length and weight. If you expect to have to cut a path through thick undergrowth get a machete or khukri; if you’re planning on splitting firewood look for a camping ax. You can carry those specialist tools when you need them, but your knife should be with you all the time. Handle material. Traditional handle materials for a folder include wood and horn; for strength, scales of these are usually fitted to a steel body. Modern synthetics can be strong enough to do without the steel core, saving weight. Aluminum is also a popular handle option, but some people don’t like the feel of it – when anodized it has a nice grippy surface, but it still feels like metal. Blade material. There are a few ceramic knives available now, but we recommend you leave them in the kitchen. They take an amazing edge but they’re too brittle for outdoor use. You need a steel blade; the choice is carbon or stainless. Carbon takes and holds an edge better, but it’s prone to rust. Stainless needs a lot less maintenance, and some modern alloys stay sharp almost as well as carbon steel. Blade shape. This isn’t actually all that important for most people; what matters is the length of the cutting edge. Tantō or sheep’s foot designs have the strongest point; a clip or spear point is better for fine work. Locking mechanism. If a folder closed up on your fingers while you’re applying force to something you can get a serious wound. You need a sturdy and reliable lock that holds the blade solidly open. Quite a few knives score well for all these points, but it’s hard to beat the 551 Griptilian by Benchmade. It’s is an excellent knife that will serve anyone well, and if you’re having trouble deciding what to buy, you could do a lot worse than this one. 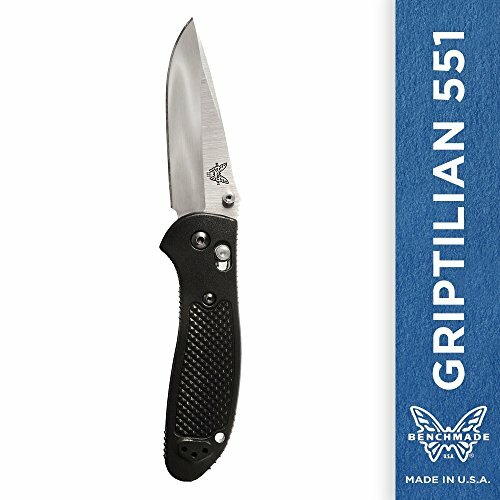 Benchmade have a name for quality knives you can use every day, and the 551 Griptilian is no exception. It’s a mid-size lightweight folder, slim enough to disappear into a pocket and be easily carried but big and tough enough to handle most cutting jobs you’re likely to encounter. It’s also completely up to date, with an ultra-strong but light synthetic handle molded from Noryl GTX. This is a blend of PPE resin and polystyrene; it’s extremely strong, and unlike many lightweight composites it’s also heat resistant. The inside of the handle is fitted with 420J stainless steel liners for wear resistance and these have grooved edges that extend to the edge of the handle above and below the pivot, giving some extra grip where you place your thumb for firm cuts. It’s not like the handle really needs more grip though, because it’s very well shaped to sit firmly in the hand and the deep checkering on the sides gives an amazingly solid hold even when wet. A generous flare below the pivot acts as a bottom guard, stopping your hand slipping onto the blade when you put some force behind it. The Griptilian’s blade is forged from 154CM stainless with a Rockwell hardness of 58 to 61; that’s hard enough to hold a really good edge without becoming brittle. It’s an interesting mix of drop and clip point; the back of the blade curves down from about the half-way point to meet the tip, like a drop point, but the curve is very shallow and ground into a false edge. The result is a sturdy point that keeps a good thickness out to the end, and should stand up to plenty of tough use. It’s not as rock-solid as Benchmade’s 950 Osborne, but it does have a slimmer profile that’s better for precise work. The lower side of the blade offers a long cutting edge that runs straight for over two inches before curving up to the point. There’s very little wasted blade length at the handle end; Benchmade have done a great job of maximizing the edge on this knife. The standard Griptilian has a plain edge but you can also get it with a serrated section – this is ideal for climbers and sailors, because it goes through rope like it wasn’t even there. The last feature of the blade is the pair of opening studs, fitted below a slight swell in the back of the blade. The rear of this swell has been neatly grooved, for some extra grip if you like to put your thumb there. This is a very nice detail. The blade pivots round a hex bolt, so if any play develops – which isn’t likely – you can eliminate it by just tightening down on the bolt. A few smaller hex screws secure the liners in place and hold the handle halves together. There are also three tapped holes each side of the handle for mounting the supplied clip – this can be fitted for left or right handed use, but only allows tip-up carry. Most people find this more convenient anyway so it’s not a big deal, and keeps the number of holes in the handle to the minimum. 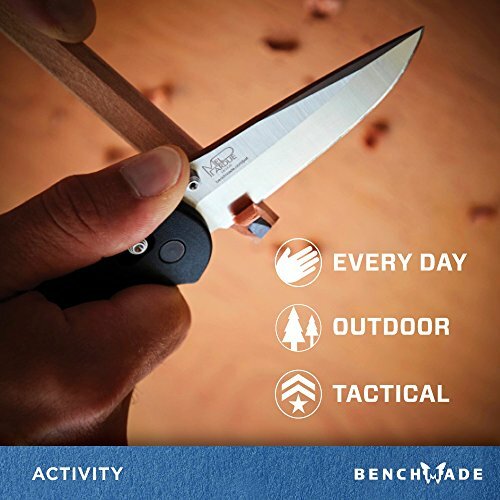 The locking mechanism is worth a mention; it’s Benchmade’s well-known Axis Lock, which engages automatically when you open the blade and is released by drawing back a stud. There’s a stud each side of the handle so it can be worked with either hand. The Axis Lock is very secure and quick to operate; it’s quickly become one of our favorites. Overall the Griptilian is a solid and dependable knife, beautifully made from top quality materials and very good value at the price – expect to pay around $95 (see here for details). It’s very much a practical design, with no unnecessary frills. This blade isn’t at all showy, just very good at its job – and it looks it. Verdict: An outstanding lightweight folder, perfect for everyday carry and a quality addition to your sporting gear. Benchmade 556 Mini Griptilian – Small hands? Just want something more compact? The Mini gives you all the Griptilian’s features in a slightly smaller package. Spyderco Tenacious – If Spyderco’s unique style appeals to you this is a good alternative to the Griptilian; the blade is the same length, but wider, and has a classic drop point. A very flat composite handle makes it ideal for discreet carry. Kizer Titanium Framelock – Ultra-light and ultra-slim, this comes with an almost indestructible titanium handle. The blade is a stylized clip point with a very long, curved cutting edge. The only drawback is so-so grip in the wet.